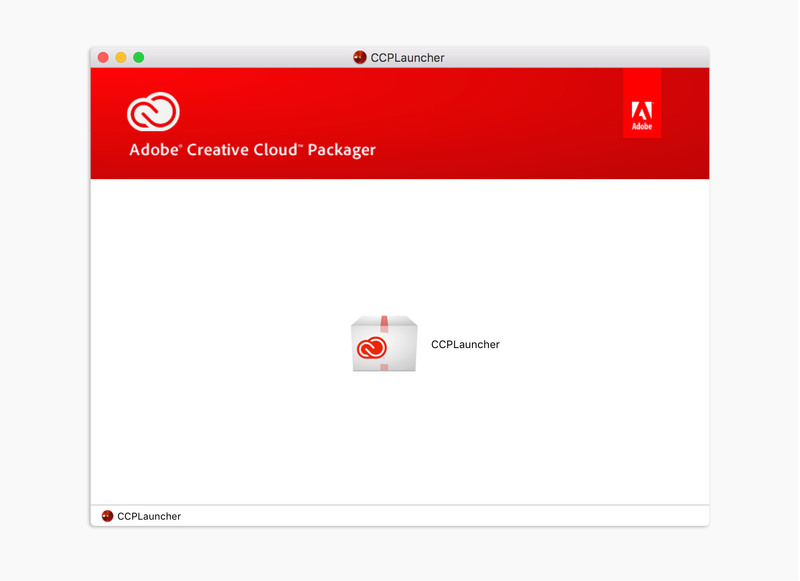 Creative Cloud Packager lets you control which Adobe Creative Cloud apps users in your organization can install and whether to allow automatic updates. 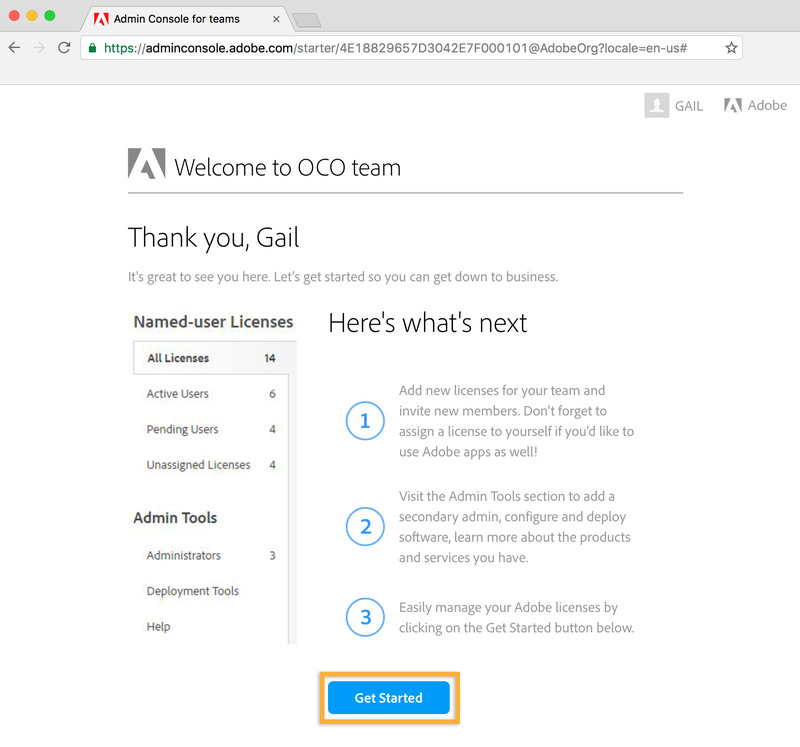 Sign in to the Admin Console with your Adobe ID and click Get Started. Note: Proceed to Step 2 if you are not presented with the Welcome screen. Under Admin Tools, select Deployment Tools. Then, download the packager for your operating system (Windows or Mac OS). The screenshots in this tutorial were created using Mac OS. Refer to Create packages for more detailed information about this process. Double-click the install file on your computer (CCPLauncher.dmg for Mac OS; CCPLauncher.exe for Win), follow the prompts, and agree to the licensing terms to install it. This step may take a few minutes. 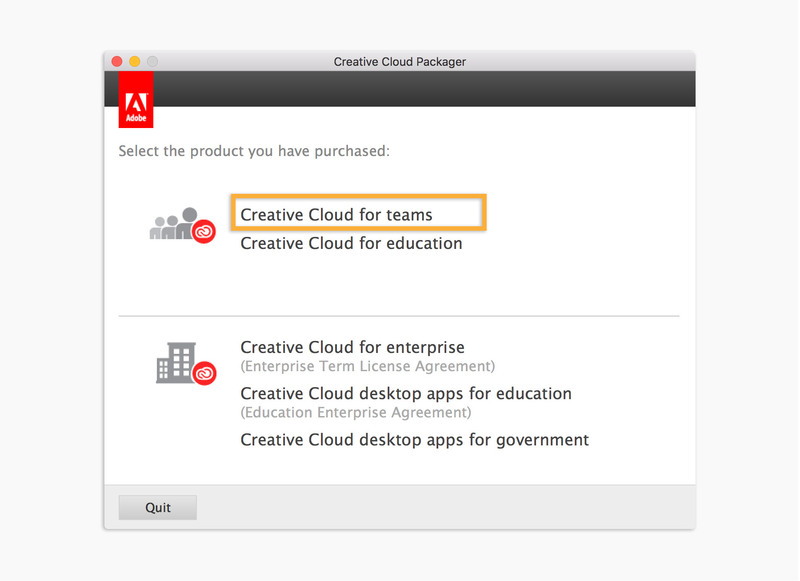 Open the Creative Cloud Packager app and select the appropriate product. 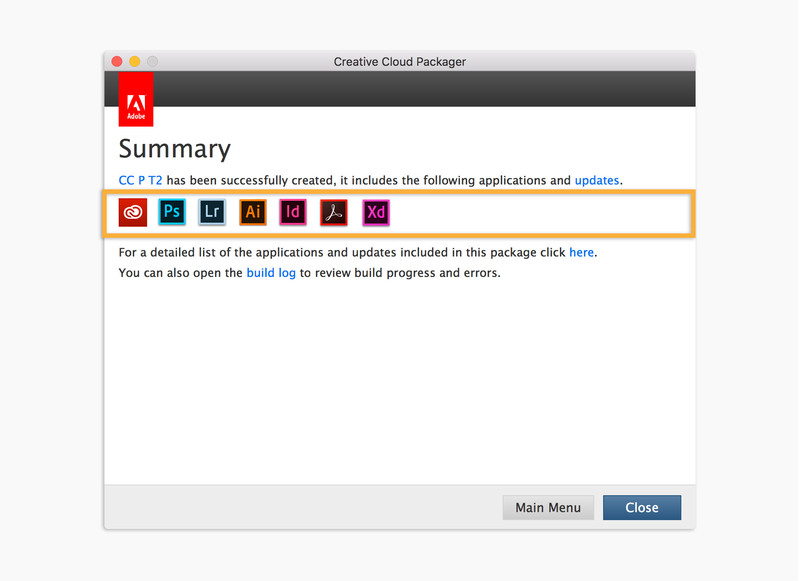 In this tutorial, we’ll create a package for Creative Cloud for teams. 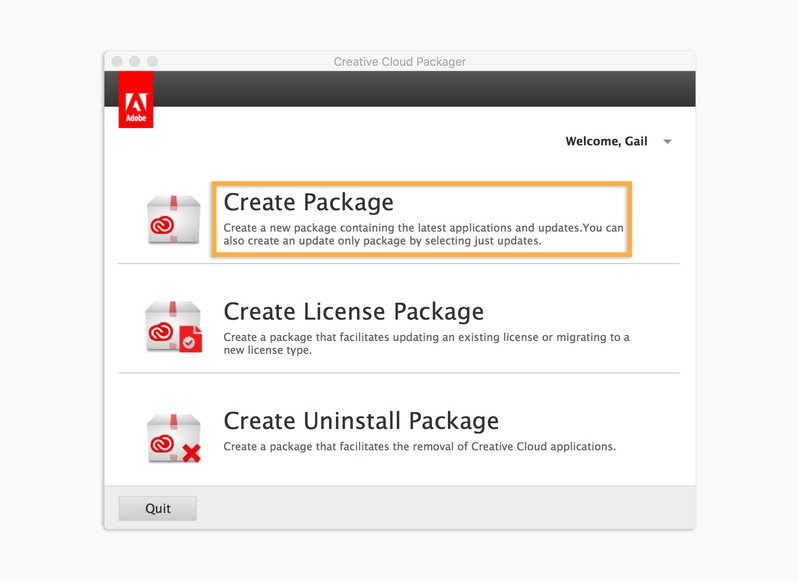 Use your Adobe ID to sign in to Creative Cloud Packager. 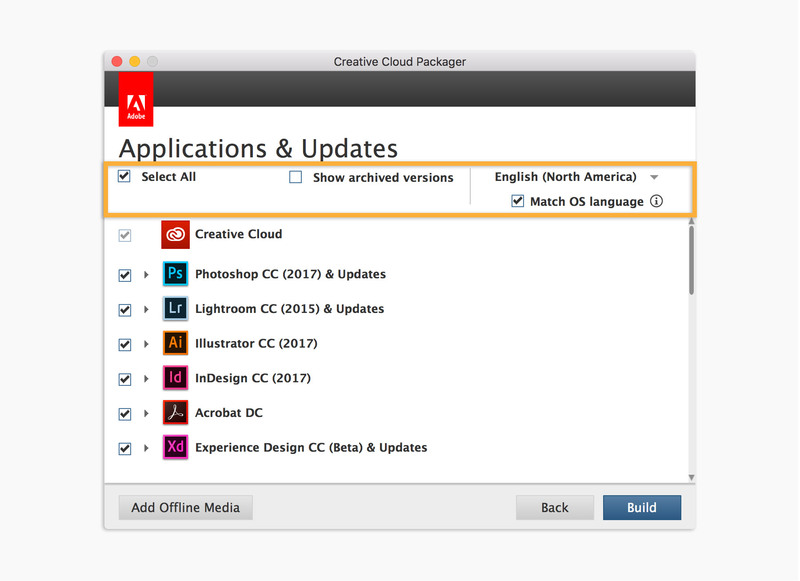 Select Create Package to create a file that contains Creative Cloud applications and updates, or a customized subset, that can be deployed across one or more computers. This file, or package, can be deployed across multiple computers using a third-party tool or installed on just a single machine using the system’s installer. Name the package and complete the Save to field to specify where to save the package file on your computer. Choose Named License as the license type. 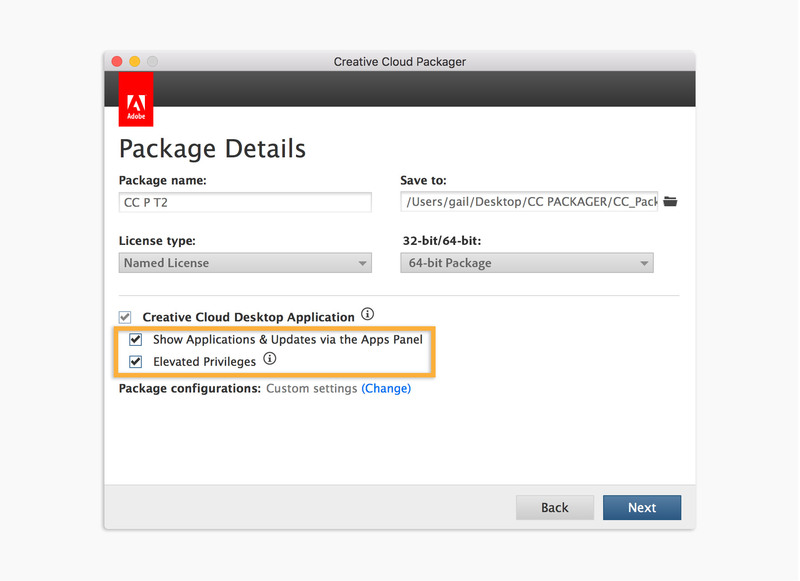 The Creative Cloud Desktop Application option is selected by default so end users can use it to access the Creative Cloud apps and services. 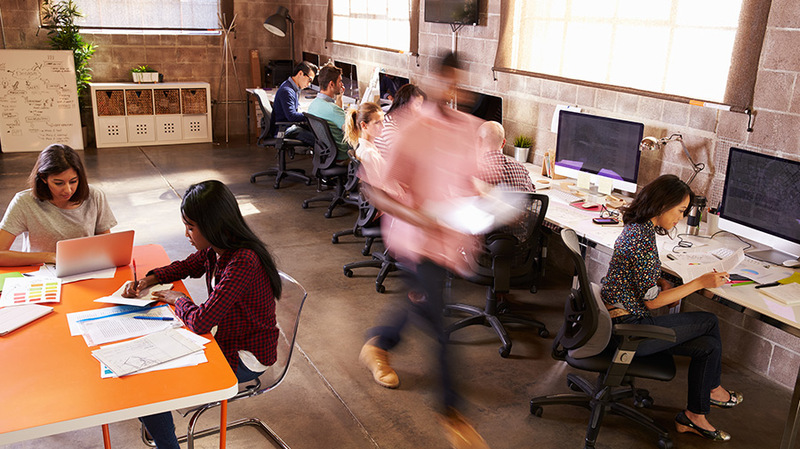 Select Elevated Privileges to allow non-administrators to manage and update applications. 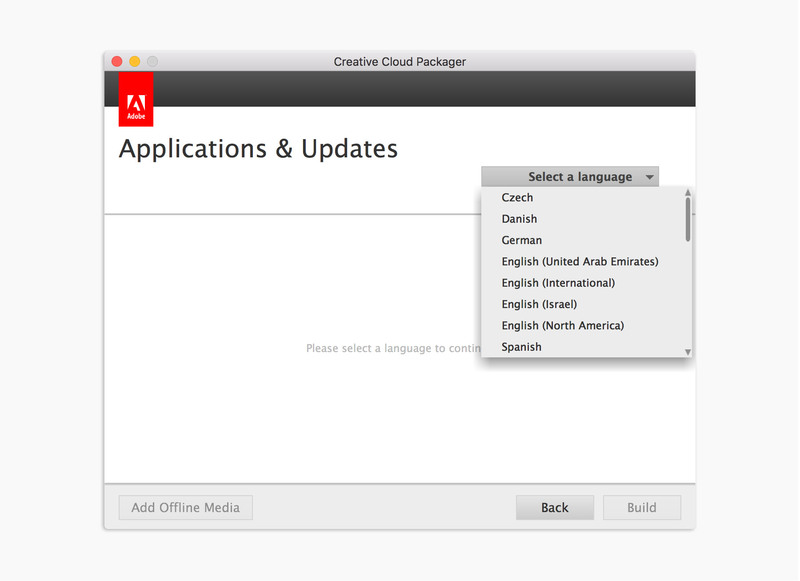 Choose the language for the package. Select all of the apps to include in the package. Select Show archived versions to include previous versions of any of the apps. Choose Match OS language to have the package deploy in the correct OS version for the end user’s computer. If you click Add Offline Media, users can add applications and updates from a local source, such as a DVD, instead of downloading from the Creative Cloud desktop app. Click Build to create the package file. This process may take a few minutes. Once you have created your package, review the Summary screen to make sure you included the correct apps. Then, test the package before deploying it. It is good practice to deploy using the platform-specific standard tool, such as Microsoft System Center Configuration Manager for Windows and Apple Remote Desktop for Mac OS. 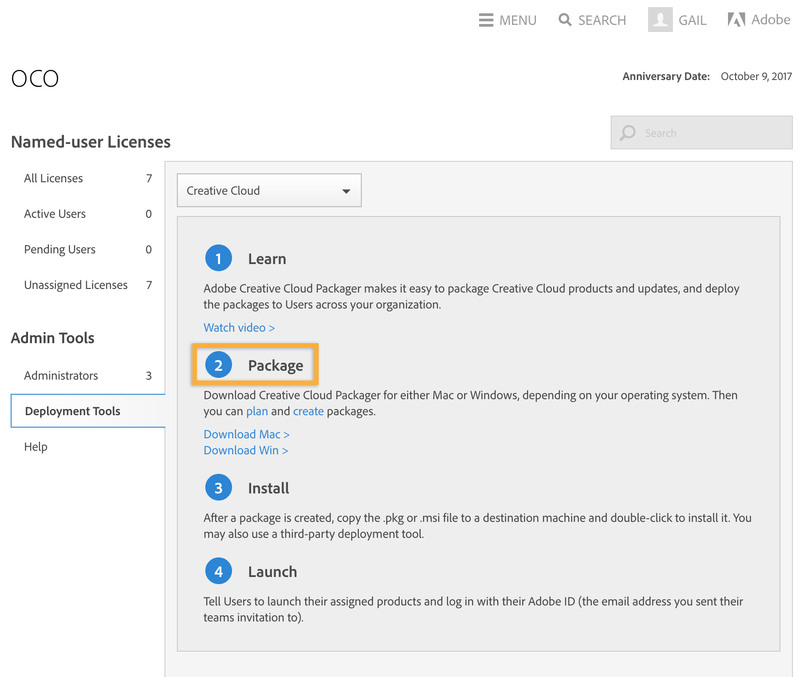 Check out Deploy packages for more details on the deployment process. Note: You can also install a package without a third-party tool. To do this, put the file on a USB drive and run it on a user’s computer. Or, place the package file on a shared drive so users can access it and run it on their computers. The Windows or Mac OS installer installs the package. If you use this method, the file needs to run and install on every computer.